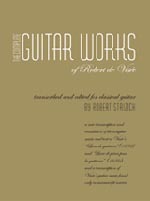 Strizich's Complete Guitar Works of Robert de Visee is an indispensable collection for the intermediate to advanced classical guitarist. Much like the Sanz' collection by Strizich, here not only do you get a performance edition of de Visee, but you get a transcription that tries to be as close as possible the baroque guitar fingerings. There is a great introduction to the collection, which gives great insight into a modern performance of de Visee's music, like how to do the strumming properly. I highly recommend this book to anyone who is serious about classical guitar repertoire. However, I think this book is best for the aspiring intermediate guitarist or advanced guitarist, as there are no fingerings. There are string indications which give you insight into the editor's fingerings, however much is left up to the performer (which is great). Like Mel Bay's Treasures of the Baroque series, this collection opens up the actual baroque repertoire for the modern guitar. Great volume. Essential to all guitar performance libraries. This particular edition is so well produced and edited, it is quite a pleasure to work from it. The delivery and handling by String By Mail was outstanding as well. Great organization. This is the first book I have bought from them and I am happy with the whole process.